Oslo/Paris, December 4, 2018: Marlink is now providing its customers operating in the North Sea with dedicated high-speed, low-latency 4G connectivity as part of its hybrid communications services, following the implementation of a private Access Point Name (APN) on the Tampnet North Sea LTE network. As the only satellite service provider providing multi-band hybrid services with integrated Tampnet North Sea LTE capacity, Marlink offers even more value to customers. 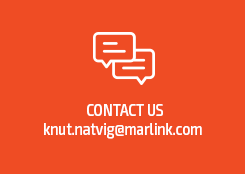 Because the 4G bandwidth available via the APN is dedicated to Marlink customers and not shared with any other vessels or users in the North Sea, Marlink guarantees access to Tampnet LTE services at all times. The result is a more streamlined, simpler hybrid service with high resilience and low-latency connectivity, as well as reduced operational overheads. Importantly, this services can contribute to reducing drillship non-productive time (NPA), by enabling reliable access to connected decision support tools. With guaranteed Tampnet bandwidth now available, crews and operations will have more opportunity to enjoy connectivity on board, opening the potential for more low-latency applications and less delay on video calls. Marlink manages the end-to-end configuration and delivery of the Tampnet service with seamless switching between VSAT and LTE. Traffic will be seamlessly routed through different available carriers depending on the unique requirements of applications used on board and network conditions at any given time, ensuring optimal use of all available channels depending on location and availability. Tampnet’s state-of-the-art, low latency, high-bandwidth North Sea LTE services are enabled by an extensive 3000 Km subsea fibre network. Our customers will be able to extend their operational, business and welfare communications capabilities. The early success of the co-operation led to a new agreement in late 2017, giving Marlink customers access to Tampnet LTE in the Gulf of Mexico also. Simon Møkster Shipping became the first vessel owner to leverage Tampnet’s innovative offshore mobile service on a fleet-wide basis in the North Sea, as part of its hybrid communications solution provided by Marlink. By adding Tampnet's low-latency bandwidth into our already flexible hybrid communications solution from Marlink, we have been able to continue developing operational efficiencies on our vessels as well providing reliable, high speed communications for our clients' and their staff in the North Sea, said Terje Gjerde, Head of IT, Simon Møkster Shipping. With dedicated Tampnet bandwidth now available to us, we can offer an even more resilient service for clients who demand fast and always available communication for effective and profitable operations. With a fully managed service combing dedicated VSAT and LTE bandwidth, we can offer true hybrid connectivity on our network, said Tore Morten Olsen. We were the first maritime satcom service provider to integrate Tampnet for vessels in the North Sea, and by securing dedicated bandwidth we once again raise the bar, confirming Marlink's position at the cutting-edge of maritime communications with exclusive offers to our customers.